The online version of this article (doi: 10.1007/s10584-014-1192-2) contains supplementary material, which is available to authorized users. The US public consistently ranks climate change as a low national priority due, in part, to a lack of personal engagement and a sense of temporal and spatial distance from the environmental effects (Leiserowitz 2006). Yet, the chief method for climate change mitigation, the reduction of fossil fuel use, would also reduce particulate air pollution, which is implicated in over three million deaths worldwide each year (Lim et al. 2013). Indeed, in the US, improved public health ranks among the top perceived benefits of reducing fossil fuel use (Leiserowitz et al. 2013), and the scientific community has been promoting these benefits—such as reduction in hospitalizations and premature deaths —for over a decade (Cifuentes et al. 2001; West et al. 2013). Furthermore, the health behavior literature demonstrates that personal perception of risk, which is likely to be linked to health, is one of the strongest motivators of behavioral change (Few 2007; Maibach and Parrott 1995). Thus, one possible method for garnering support for carbon emissions reduction is to emphasize the added co-benefit of reducing present-day, health-related impacts. However, it remains to be understood whether public health messaging can lead to improved climate change mitigation efforts, or how specific segments of the US population will respond to this message. In particular, emphasizing health co-benefits may be a strong motivator of attitude change among individuals who are less concerned about environmental threats or who deny the existence of anthropogenic climate change. We consider these ideas in the context of framing, a decision-making phenomenon whereby the language used to describe options greatly influences the decision maker’s choice (Tversky and Kahneman 1981). Previous research has shown that the framing of an environmental issue can have a significant influence on public opinion and engagement (Nisbet 2009), and that framing effects are often modified by political orientation. For example, the use of the term “tax” instead of “offset” and “global warming” instead of “climate change” resulted in differing beliefs and intended actions depending on political orientation (Hardisty et al. 2010; Schuldt et al. 2011). Recent research suggests that public health messaging could strengthen the argument for climate change mitigation. 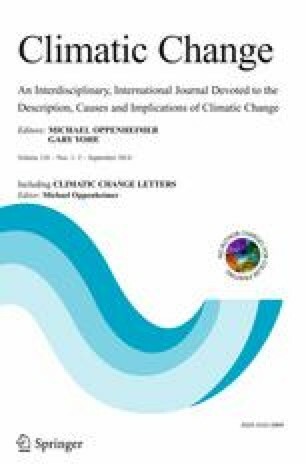 Indeed, casting climate change as a public health issue has been shown to elicit positive emotional responses (Maibach et al. 2010; Myers et al. 2012; Semenza et al. 2011). These studies generally focus on the future health consequences of climate change and fail to capitalize on the present-day health co-benefits of fossil fuel use reduction, or combine the health risks of inaction and health benefits of action into a single frame. However, using a public health framed essay on climate change, Maibach et al. (2010), found that strategies focusing on the positive health co-benefits of mitigation action exhibited greater potential than strategies focusing on the adverse health impacts of climate change. In the current research, we examined whether framing fossil fuel emissions in terms of public health versus climate change differentially influenced attitudes towards mitigation efforts. In order to examine the most compelling version of the public health frame, we focus on the immediate, direct benefits of fossil fuel reduction on air pollution, de-convolving this frame from future benefits or indirect health impacts. Furthermore, we move beyond previous work that used emotional response as the dependent variable of interest (Maibach et al. 2010; Myers et al. 2012) by instead examining the effect of health framing on attitudes regarding efforts to decrease the use of fossil fuels. Additionally, the few previous studies that have examined the role of health framing employed a long essay format that contained a mixture of health and climate messaging (Maibach et al. 2010; Myers et al. 2012). In contrast to this previous work, we employ a randomized experimental design, using a subtle language manipulation commonly used in behavioral decision-making research, in which a single attribute is the subject of a framing manipulation (Levin et al. 1998; Tversky and Kahneman 1981). This experimental approach directly investigates the influence of public health versus climate change messaging by reducing confounding factors within our experimental design and offers an alternate methodology that complements previous results. Moreover, the current research explores how health versus climate framing interacts with individuals’ pre-existing political orientation. Research on environmental values, beliefs, and attitudes consistently demonstrates that self-identified liberals are more pro-environmental than self-identified conservatives in the American public (Lorenzoni and Pidgeon 2006; McCright and Dunlap 2011). Thus, we explore to what extent political orientation permeates issues related to fossil fuel emissions when climate change is not explicitly mentioned. Motivated by previous research (Hardisty et al. 2010), we predicted that public health framing would have a more positive connotation relative to climate change framing among conservative individuals, but that there would be no effect of frame among liberals. Study 1 (N = 402) examined attitudes about the public health and climate impacts of fossil fuel burning and motivated our subsequent framing manipulations. In this and all studies, participants residing in the United States were recruited via the website Amazon Mechanical Turk, through which participants can take surveys online in exchange for small payments (Buhrmester et al. 2011). Research shows that participants drawn from this panel are often more diverse than commonly used online human subject and university student samples and are more representative of the US population than in-person convenience samples (Berinsky et al. 2012; Buhrmester et al. 2011). The demographic details for all studies are included in the Supplementary Materials. Ninety-seven percent of these participants passed a quality assurance survey item, which measured participants’ attention to question wording. All studies were approved by Columbia University’s Institutional Review Board. Each participant answered a series of questions assessing his or her beliefs and level of concern about fossil fuel burning, as well as his or her willingness to take action on this front. Additionally, participants answered questions about whether they believed in, or worried about the health and climate change impacts of fossil fuel burning, and questions assessing their perception of the proximity of these problems in time and space. In all studies, the subjects were asked to self-identify their political orientation on a scale from 1 = very liberal to 5 = very conservative. Political orientation was treated as an ordered variable in all subsequent regression analyses. Although the health-related impacts of fossil fuel burning were generally perceived as more certain, closer in space and time, and more personally threatening than the effects of climate change, self-identified political orientation determined how much the perception differed. Liberals were generally more certain than conservatives about both negative health and climate effects of fossil fuel burning. This was demonstrated by ordered logistic regressions of perceived certainty (measured by a 5-item agreement scale) and political orientation (Climate Change: β = −0.96, t = −8.7, p < .0001; Health β = −0.61, t = −5.81, p < .0001), controlling for age, gender, marital status, income and education. Thus, climate change is not the only scientific issue where perceived certainty is mediated by political orientation, although political orientation had a greater effect on certainty of climate effects than that of health effects. The coefficients differed at a statistically significant level (t = −3.44, p < 0.001), as shown by an interaction between political orientation and a dummy variable indicating whether the response was related to health or climate (see Supplementary Materials for details of analysis). We found similar patterns for nearness in space and time, and personal risk. Climate effects were perceived to be more spatially and temporally distant than health effects by all measures and, in general, conservatives perceived the effects to be more distant than liberals. We next examined whether these differences in risk perception altered beliefs about mitigation measures by asking subjects to select the most compelling reason to reduce the burning of fossil fuels: Climate, Health, or Neither. As shown in Fig. 1, the differences in the selected proportion for each of the three responses vary with political orientation, which was a statistically significant predictor in a multinomial logistic regression (LRchisq = 47.25, p < 0.0001), adjusted for other demographic characteristics, including age, gender, marital status, and education. The proportion of individuals who selected Climate decreases with political conservatism while the proportion choosing Health increases for all but the most conservative individuals who overwhelmingly choose Neither. The willingness of moderates and conservatives to select Health as a compelling reason to reduce fossil fuel use suggests a potential source of motivation for this population. Finally, we examined whether choosing the Climate, Health, or Neither option was predictive of a desire to reduce fossil fuel use. Notably, in an ordered logistic regression controlling for demographic characteristics, subjects who selected either Health (β =1.80, t = 5.11, p < 0.0001) or Climate (β =2.54, t = 6.80, p < 0.0001) were significantly more likely to be supportive of fossil fuel reduction policies than those who selected Neither. Taken together, these results point to the overlooked potential of health as a motivating factor in a nuanced discussion of fossil fuel use reduction that moves beyond the usual paradigm. Motivated by these results, we conducted framing experiments to test whether emphasizing present-day health impacts could motivate mitigation action in the US public. In a pilot experiment (N = 402), completed as part of Study 1, subjects were randomized to read one of two versions of a statement framing fossil fuel burning as a public health or climate change threat and then asked a series of questions about their support for mitigation efforts (see Table 1 for statement wording and Supplementary Materials for questions). The manipulation did not reveal a difference in concern or support for mitigation initiatives between the two frames. This null effect prompted further investigation into whether inclusion of the term “fossil fuel” in the public health frame had primed associations of climate change, and thus biased our manipulation. Study 2 (N = 397) was designed to test whether individuals were more likely to agree that carbon emissions are harmful to human health when they are referred to as “air pollution” in the absence of fossil fuel terminology. Because the term “fossil fuel” may have political associations itself, we hypothesized that this framing manipulation would have a greater impact on conservative individuals than liberal individuals. To test this, subjects were randomized to read one of two versions of a statement (see Table 1) about harm to human health resulting from air pollution, with one specifying the pollution to originate from “fossil fuels (coal, oil, and natural gas),” and asked how strongly they agreed with this statement. As predicted, when the term “fossil fuel” was mentioned, conservatives were significantly less likely to agree with the statement than liberals, but when the term was omitted, the relationship between political orientation and agreement diminished (see Fig. 2). An ordered logistic regression, adjusted for demographic characteristics, revealed a significant interaction between frame and political orientation (ß = −0.63, t = −2.87, p < 0.01). Conservative individuals were much more likely to agree with the statement that pollutant emissions are harmful to human health when emissions were referred to as “air pollution” (M = 3.20, SD = .91) than when the statement contained fossil fuel terminology (M = 3.86, SD = 0.83, t = 2.60, p =0 .012). In contrast, among liberal individuals, the frame did not have an impact. This suggests that the term “fossil fuel” may reinforce political identity, and should therefore be considered carefully before being included in public health messaging. In Study 3 (N = 794), we returned to the hypothesis that framing air pollution as a cause of present-day public health impacts, rather than climate change, may garner greater support for mitigation measures among conservatives. Because the results of Study 2 indicated that the term “fossil fuels” can influence reactions to public health messaging, Study 3 was designed to repeat the experimental manipulation of Study 1, omitting references to fossil fuels. Half of the participants were randomly assigned to the health frame and half were randomly assigned to the climate frame. After reading the framing statement (see Table 1) and responding with their level of agreement, all subjects were asked a series of questions about their opinions regarding the reduction of air pollution (see Supplementary Materials for complete question text). Political orientation was a significant predictor of whether or not subjects agreed with the initial framing statement about the harmful effects of air pollution, with the relationship in the climate frame (ß= −0.96, t = −8.41, p < 0.0001) being stronger than the relationship in the health frame (ß= −0.65, t = −5.79, p < 0.0001), as shown in Fig. 3a. The coefficients differed at a statistically significant level (p < 0.001, t = 3.75), as revealed by an interaction between political orientation and a dummy variable for frame (see Supplementary Materials for details of analysis). Thus, conservatives were more likely to agree that air pollution has harmful impacts when presented with a public health frame, while liberals were more likely to agree that air pollution has harmful impacts when presented with a climate change frame. To examine whether these results could be explained by an alternative demographic segmentation, we performed a secondary analysis testing whether two measures of socioeconomic status (income and educational attainment) modified the effect of frame. We did not find any significant interactions between frame and either measure. Participants in both frames answered a series of identical questions related to air pollution reduction. We analyzed whether the frame significantly affected the subject’s responses, adjusting all analyses for demographic characteristics, including age, gender, marital status, and education. When subjects were asked whether air pollution should be reduced, we observed a significant interaction between frame and political orientation (ß = 0.38, t = 2.44, p < 0.05) such that conservatives were more likely to support reduction when in the health frame, while liberals were more likely to support reduction when in the climate frame (see Fig. 3b). When asked to report agreement with policies implemented by the government to reduce air pollution, we again observed a significant interaction between frame and political orientation (ß = 0.44, t = 3.12, p < 0.01, see Fig. 3c). A concrete example of a regulation—the recently implemented vehicle efficiency standards—exhibited a similar pattern, but did not reach statistical significance (ß = 0.24, t = 1.71, p = 0.09). Interestingly, the interaction between frame and political orientation did not persist for all dependent variables. We asked subjects whether they felt personally responsible for reducing air pollution and observed no significant interaction between frame and political orientation. Instead, the climate frame garnered stronger agreement overall (β = −0.69, t = −5.13, p < 0.0001, see Fig. 3d). The climate frame also garnered a stronger willingness to donate to a charity for all subjects that was marginally significant (β = −0.24, t = −1.82, p = 0.07). Willingness to pay more for electricity did not exhibit a statistically significant main effect of frame, nor an interaction effect with political orientation. Obtaining widespread public support for environmental policy change is increasingly difficult, as scientific issues become more and more politically polarized in the United States. This is further supported by studies indicating that certain segments of the population are unlikely to be motivated by any frame that emphasizes environmental benefits due to the strength of their political identity (Bain et al. 2012; Gromet et al. 2013). In the present experiments, we use a US-based subject pool to specifically focus on the present-day, public health co-benefits of mitigation action and provide the first experimental evidence that health is a stronger motivator of attitude change than climate change among conservative individuals. While we hypothesized that liberals would be equally supportive regardless of frame, we find instead that climate change is a stronger motivator for liberals. A potential explanation for this result may be the ideological and media focus on the topic of climate change in recent years. Among liberals, the issue of climate change mitigation may be more relevant, familiar and emotionally motivating than public health concerns (Boykoff and Boykoff 2004; Nisbet 2009). These results are consistent with Myers et al. (2012), who reported that participants with existing climate change attitudes characterized as “cautious”, “disengaged”, or “dismissive” were most hopeful in the public health frame, while participants who were characterized as “concerned” about climate change were most hopeful in the environment frame. Notably, we found that questions that implied an externally imposed solution (e.g., air pollution reduction, government policies, and efficiency standards) exhibited an interaction between frame and political orientation, such that the health frame elicited a stronger response for conservatives and the climate frame elicited a stronger response for liberals. On the other hand, this was not the case when solutions emphasizing personal choice (e.g., personal responsibility, donation, paying more for clean electricity) were presented; and in this case the climate frame elicited a stronger response for all subjects regardless of political orientation. This result is consistent with previous research on identity affirmation, in which individuals tend to react dismissively towards information that opposes their cultural values (Cohen et al. 2000; Cohen et al. 2007; Kahan 2010). In particular, a recent paper (Kahan et al. 2012) found that hierarchical individualists (correlated with conservatism) were less likely to find a climate change study scientifically valid if the proposed solution involved air pollution regulation, while communitarian egalitarians (correlated with liberalism) were less likely to find it valid if the proposed solution involved geo-engineering. In our study, responses to questions about externally imposed solutions exhibited a difference in processing of climate and health frames between conservatives and liberals. Through the lens of identity affirmation theory, externally imposed solutions may thus have led to the reinforcement of political identity, explaining this result. On the other hand, solutions with an emphasis on personal choice are less likely to reinforce political identity, thus resulting in more similar processing of frames. A related mechanism may be at work in further explaining the results of Study 2, in which conservative individuals were less likely to agree with a statement linking air pollution and negative health effects if the pollution was specified to originate from fossil fuels. This may be due to an assumption that further regulation of fossil fuels is the only solution, reinforcing political identity. Interestingly, conservatives had a higher risk perception for health and economic consequences of a sudden increase in oil prices (Nisbet et al. 2011), indicating that the coupling of economic and health consequences may further complicate risk perception as it relates to political identity. Finally, the main effect of the climate frame on personal responsibility, present regardless of political orientation, may be explained by the proliferation of public campaigns that explicitly link climate change to a personal responsibility to conserve energy, a link that has not been made for public health impacts of air pollution. Further research is needed to determine precisely what cultural cognition influences, confirmation biases, and other preconceived notions may account for the differential influence of public health and climate change frames towards mitigation efforts. Our results provide evidence that merely altering a few words can elicit a more favorable attitude toward mitigation, and indicate that an intervention of larger scale involving health messaging (e.g., educational campaigns, visual images, emotional appeals) may engender an even greater response. Although the absolute differences in effects in the present study are relatively small, we note that they were the result of a very subtle experimental manipulation rather than a full intervention. Because our online samples were not perfect representations of the population, future research is needed to corroborate these findings in nationally representative panels. In particular, more individuals from the extreme conservative end of the ideological spectrum, where the sampling was sparse although the signal appeared to be strongest, must be included. Given the present focus on US-based political ideologies, future studies should explore additional methods of audience segmentation that may be relevant in other geographic regions, including socioeconomic indicators, existing health conditions, and access to health care. It is worth noting that the public health and environmental phenomena may be closely related and overlap in participants’ minds, and that a single-sided message may not realistically model the competitive message environments to which most individuals are naturally exposed (Nisbet et al. 2013). Additionally, changes in attitudes may not necessarily correspond to behavior change, depending on how closely the attitude in question corresponds to a target behavior (Ajzen and Fishbein 1977). In future work, these issues could be more thoroughly explored through the use of additional methodological frameworks, including: open response questions, questions geared towards specific behaviors, and opportunities for subjects to make a donation towards mitigation efforts as a proxy for behavior change. Our finding that responses were dependent upon the type of solution proposed is intriguing and suggests that including a broader set of policy options, such as incentives for business and technology development, may provide opportunities for political agreement and should be considered in future research. Finally, further study is needed to examine the role of source credibility in public health messaging, and to determine the most engaging messengers for present-day health concerns, such as local public health officials, medical personnel, faith-based community leaders, and municipal party leaders. In sum, our findings indicate the potential for motivating mitigation through a new and underutilized framework: leveraging the public’s willingness to support fossil fuel reduction policies that promote present-day public health benefits to garner broad support of policy change in the US. Further study is needed to determine whether a sustained and carefully crafted communication strategy will help to engage a broader coalition of Americans and others around the world. This research has been supported by The Earth Institute Cross-Cutting Initiative and The Earth Institute Postdoctoral Fellows Program at Columbia University. We thank the members of the Center for Research on Environmental Decisions for helpful comments and especially: David Krantz, Sabine Marx, Ezra Markowitz, Elke Weber, and Ben Orlove, as well as Patrick Kinney at the Mailman School of Public Health; and Danielle Smith for research assistance. N.P. and J.M. conceived the project and obtained study funding. N.P., J.M., and L.Z. designed studies 1 and 3. N.P. and L.Z. designed study 2. All authors analyzed the data and contributed to the writing of the manuscript. The authors declare no competing financial or personal interests. Correspondence and requests for materials should be addressed to N.P.